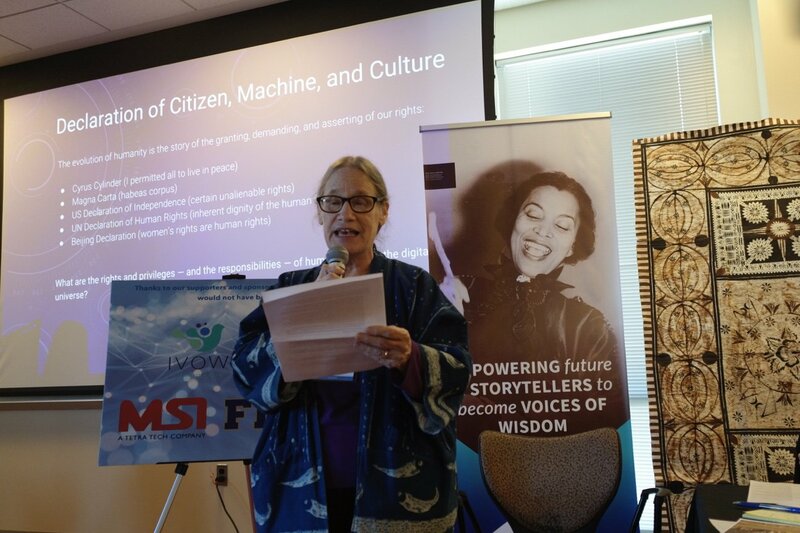 At a Morgan State University AI & Culture Symposium, IVOW's Kee Malesky channels history to highlight the active debate on balancing human needs and rights with the challenges of the digital universe. Ellen Yount of Management Systems International, Nisa McCoy of IVOW, Louise Stoddard of the United Nations and AI expert Rafael Perez y Perez. Students and faculty from the University of Maryland and Morgan State University were among those participating or documenting conversations around the symposium. Davar Ardalan is the Founder and Storyteller in Chief of IVOW. She has been a journalist in public media for 25 years, most of those at NPR News, where she designed stories anchored in multiculturalism and steeped in historical context. In 2015, her last position at NPR was senior producer of the Identity and Culture Unit. Realizing that there is a gaping hole in AI algorithms that will define our future stories, Davar created IVOW, whose AI software sifts through data on world cultures, traditions and history for modern consumer storytelling applications. IVOW’s intent is the effective fusion of AI with cultural storytelling to help diminish bias in algorithmic identification and train AI software to be much more inclusive. Kee Malesky is IVOW’s Director of Research. Her 30-year career as a news librarian for National Public Radio prepared her for quick research and ​fact-checking on deadline, which she continues to find fascinating and fulfilling work. ​Kee’s copy-editing abilities come from her experience as the author of two books (All Facts Considered and Learn Something New Every Day), as well as from working on book projects with former NPR colleagues Scott Simon, Davar Ardalan, Jacki Lyden, and others. Before her retirement in 2013, Kee was the recipient of several awards from international library organizations.